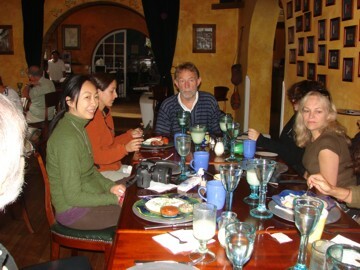 We meet the Pachamama guide (Linda Leyerle – back center), the Ecuadorian guide (Christine "Cuqui" Serrano - front right), the couple from Germany (Frank Schulte and Pavithra Novak – back left), the mother and daughter from S.F. 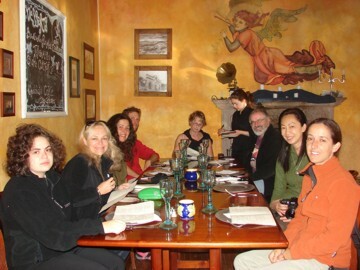 (Julie and Christine – front left)and the Asian photographer also from California, Louisa Wu – next to me on the right. Bill Twist, president of the Pachamama Alliance joined us. To preserve the Earth’s tropical rainforests by empowering the indigenous people who are its natural custodians. There is lively conversation and Bill brings us up to date on developments with supporting the Achuar. One of the big things is getting a plane to transport people to the eco-village. He also talked about the new Ecuadorian constitution which will be voted on in late September. It includes rights for the natural world. Bolivia, Peru and Columbia are interested in doing the same. Back at the room, Charlotte finds all this crap on the back of her foot. Turns out it really is crap. Don’t know where it came from but we had to use the alcohol in the wine to get it off.